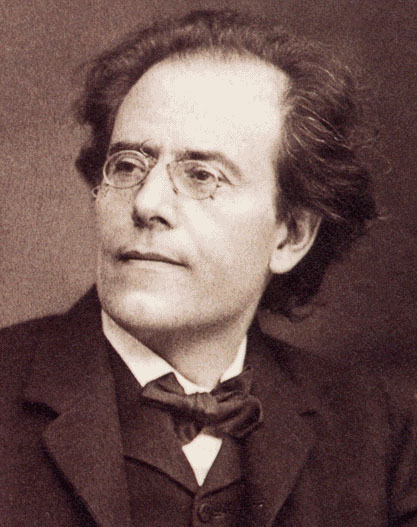 Gustav Mahler was born in Kalište, in the Austro-Hungarian Empire, the second of twelve children. In 1875 he was admitted to the Vienna Conservatoire where he studied piano under Julius Epstein, harmony with Robert Fuchs, and composition with Franz Krenn. He later attended Vienna University at which time he worked as a music teacher and wrote his first surviving compositions including the cantata Das Klagende Lied. In 1880, Mahler began his career as a conductor with a job at a summer theatre at the Bad Hall (thermal baths) near Vienna. From this humble beginning his reputation grew and in the following years he enjoyed a series of increasingly prestigious appointments: Ljubljana (1881), Olomouc (1882), Vienna (1883), Kassel (1884), Prague (1885) Leipzig (1886) and Budapest (1888). His first long-term appointment was at the Hamburg Opera in 1891, where he stayed until 1897. Mahler’s first symphony went through a significant metamorphosis before reaching its final form. On 20th November 1889, in Budapest, he conducted the premiere of a work he called “Symphonic poem in two parts”. Blumine was the second movement of this piece, though without any title. On October 27th 1893 Mahler conducted a substantially reworked version entitled “Titan, a tone poem in symphonic form”. The name Titan refers to the novel by Jean Paul Richter (1763-1825), and was intended to convey the image of a passionate young man moving between extremes of hope and despair. The five movements were given programmatic titles, Blumine again appearing as the second movement. The work was preformed unchanged in Weimar the following year. However, at the next performance in Berlin on March 16, 1896, Mahler had removed both Blumine and the programmatic names and had given the work the bland title “Symphony in D major for large orchestra”. This was the version that was finally published as his first symphony in 1899. Blumine was never printed in his lifetime, and considered lost until 1959, when an original manuscript of the 1893 version appeared for auction at Sotheby’s. Benjamin Britten gave the movement its 20th-century premiere at the Aldeburgh Festival on June 18, 1967. It is not certain exactly why Mahler decided to cut Blumine from his first symphony. He was a highly self critical composer, as is evidenced by the story of its composition, and by the relatively small number of his completed works. It is therefore quite possible that he thought it not good enough for publication. Another theory is that he removed the movement against his better judgment to shorten an already long symphony to make it more suitable for publication. Modern critical opinion is equally divided on the merits of the work, some writers describing the movement as “sentimental” and “sugary”, and others describing it as “exquisite” and “touching”. However we judge it, the movement gives us a clear insight into the hopeful and romantic side of the young Titan. Mahler's Blumine was performed by the Portobello Orchestra on the 9th December 2006. The conductor was Anthony Weeden.